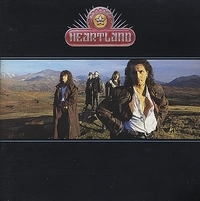 Heartland always was Chris Ousey's band and with the self-titled debut they hit the melodic rock scene in 1991. Back then A&M Records released the album and soon made themselves known as one of the best British melodic rock acts. Melodic rock fans looking for this rarity and so YesterRock re-released this melodic rock gem! Thanks for making this album available again! And hopefully more people discover the music of Heartland who are still active, even if by now they have a different line-up. If you love melodic rock and don't own this album, then it's time to change this! Get it now!